Water & Chalk of Seattle is already known as a premier source of custom lettering and illustration. In an exciting development, they have just announced their first curated collection: Flora. The collection, available online November 8th, will feature three original floral illustrations one quotation in hand-drawn brush lettering, printed onto 11 exquisite gift items. Seattle, WA, November 7, 2016	(Newswire.com) - ​While the weather may be cooling off, these cheerful and elegant printed items are sure to help every stylish nature lover carry spring with them year round. 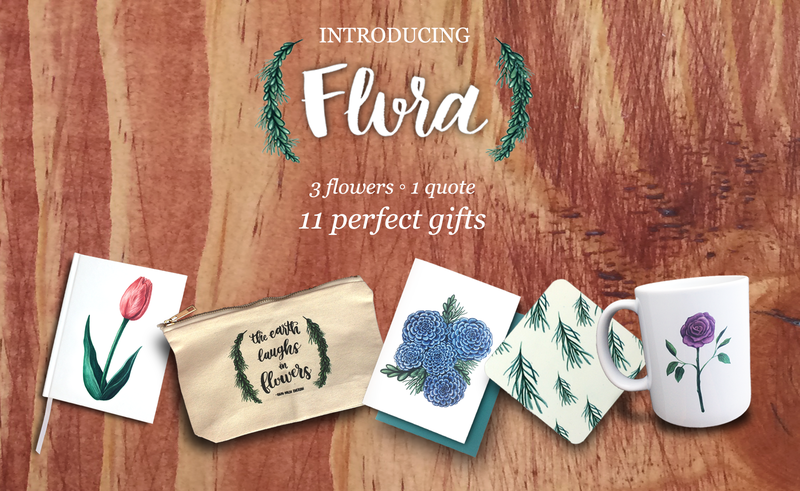 Flora launches on Tuesday, November 8th – just in time for holiday shopping. Water & Chalk is expecting the collection to sell out quickly, as only limited numbers of items are available. Three all new, naturalist-inspired floral illustrations (rose, succulent, and tulip) along with a beloved Ralph Waldo Emerson quote (“The Earth Laughs in Flowers”) are sure to make this collection an instant hit. For the writer, Flora includes both versatile journals and stylish, durable pencil bags. The company kept in mind those who love both writing and sketching, by alternating lined and unlined pages to suit whatever the author’s needs might be. Customers have the option to choose their favorite of the journal designs or a gift set of all three. Tea and coffee enthusiasts should be sure to see the polished, crisp design that’s featured on the mugs and cork-backed coasters. The mugs each feature a stunning floral illustration on one side for a splash of color and the quote in original black and white brush lettering on the other side – beauty for both the person drinking and the person they’re sitting with. These are also available in a gift set of 3, in case the coffee connoisseur can’t decide. Three simple, floral, high quality greeting cards complete the collection. They’re blank inside to express any thought, and include high quality envelopes in a color specifically chosen to complement their design. Anyone who appreciates that a superior greeting card is also a work of art will be thrilled. These aren’t the kind of cards that get recycled! Molly Good, the artist behind the collection and owner of Water & Chalk, explains her dual inspiration, “The quote from Ralph Waldo Emerson is one of my favorites – I think it’s so important to remember the beauty of nature, especially when it gets rainy here in Washington. I love to give thoughtful gifts, and I’ve found that I’m not the only one who wants something more special than a mass-produced card.” Each piece in the collection features either the hand-lettered quotation, one of her three original floral illustrations, or both. Water & Chalk is a distinguished lettering and illustration company that produces vibrant original designs. Flora will be available for purchase on their secure website, https://waterandchalk.com, where more information about the company and their services can also be found. Water & Chalk also maintains an active social media presence, especially through their Instagram @waterandchalk.